Chromosomal inversions have long fascinated evolutionary biologists for their role in adaptation and speciation. These structural variants are abundant in natural populations and can have diverse evolutionary consequences. They can cause reproductive isolation through hybrid sterility or protect sets of co-adapted alleles from recombination, while inversions in genes or promoters can disrupt gene expression. A recent review paper by Maren Wellenreuther and Louis Bernatchez published in TREE comprehensively summarises what is known about the biology of inversions. Wellenreuther & Bernatchez (2018) include a list of about two dozen species where inversions have been characterised in the wild, and come to some interesting conclusions about inversion size (important inversions are often large), age (they’re often old and pre-date speciation), and the evolutionary processes that act on them (balancing selection may be important). Representative examples of taxa with well-characterised chromosomal inversions, and their evolutionary consequences. From Wellenreuther & Bernatchez (2018). This paper is a clear reminder of the importance of inversions in evolution. Reading the review, however, made me wonder just how common inversions are in speciation, adaptation, and the maintenance of species differences, or whether their perceived importance is biased by their ease of detection. In many genetic analyses inversions stand out like a sore thumb. They can be spotted in genome-wide alignments, or may be seen as large regions of divergence in outlier scans. Inversions are also obvious in genetic maps where you see clusters of markers with reduced recombination. Making a causal link between inversions and adaption is harder, but there are many cases where quantitative trait loci (QTL) co-occur with inversions and implicate their role in adaptation (e.g. Lowry & Willis, 2010). This question about the ubiquity of inversions in speciation studies is partly addressed in a recent paper by Davey et al. published in Evolution Letters. Davey et al. (2017) investigated whether species barriers between closely-related hybridizing taxa are always maintained by inversions, and answered this with a resounding “no”. While this shouldn’t come as much of a surprise, it is useful case study that brings balance to the recent inversion-heavy evolutionary literature. In their study, Davey et al. (2017) use genetic mapping, genome assemblies, and long-read sequencing to look for inversions that differ between two sympatric species of the widely studied butterfly genus Heliconius. They showed hybridising H. cydno and H. melpomene completely lack any large inversions (over 50Kb in length) that are likely to be involved in maintaining co-adapted gene complexes. Their use of high quality genome assemblies and long-read sequence data make it unlikely that any large inversions would be overlooked. The authors conclude that: “This suggests that hybridization is rare enough and mate preference is strong enough that inversions are not necessary to maintain the species barrier”. So, how often are inversions involved in speciation? Clearly we need more studies investigating the genomic basis of species differences in order to answer this question. But we should also remember that the prevalence of studies that implicate inversions in adaptation and speciation are likely (at least in part) to be due to the ease of detecting inversions, and the methodological constraints in finding individual loci underlying divergence. In Heliconius butterflies, and no doubt many other organisms, divergence has occurred in the face of homogenizing gene flow despite lacking major inversions. 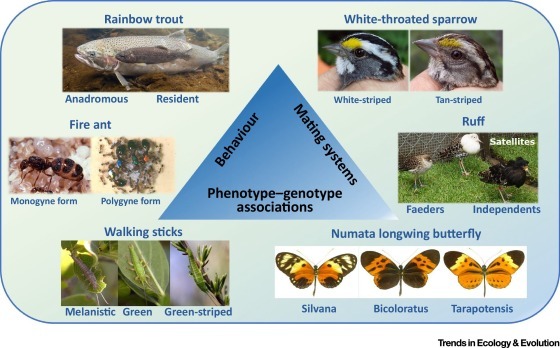 Future studies investigating the genetics of speciation and adaptation should broaden the search to other genic modifiers of recombination rate (reviewed in Ortiz-Barrientos et al. 2016), to more fully understand how the recombination landscape influences speciation, while also continuing the search for elusive speciation genes. Davey JW, Barker SL, Rastas PM, et al. (2017) No evidence for maintenance of a sympatric Heliconius species barrier by chromosomal inversions. Evolution Letters 1, 138-154. Lowry DB, Willis JH (2010) A widespread chromosomal inversion polymorphism contributes to a major life-history transition, local adaptation, and reproductive isolation. PLoS Biol 8, e1000500. Ortiz-Barrientos D, Engelstädter J, Rieseberg LH (2016) Recombination rate evolution and the origin of species. Trends in Ecology & Evolution 31, 226-236. Wellenreuther M, Bernatchez L (2018) Eco-evolutionary genomics of chromosomal inversions. Trends in Ecology & Evolution 33, 427-440. Alex Twyford is a Research Fellow at the University of Edinburgh, and a Research Associate at the Royal Botanic Garden Edinburgh. He studies the ecology and evolution of plants. Twitter @alex_twyford. This entry was posted in adaptation, genomics, hybridization, next generation sequencing, speciation and tagged chromosome structure, inversions. Bookmark the permalink.